Pelagios 1 and 2 worked entirely with the Pleiades gazetteer of the classical world, based at the Institute for the Study of the Ancient World at New York University, and Pelagios 3 annotations from Greek and Roman sources will be linked into Pleiades. However, the scope of Pelagios 3 is broader, so annotations from Chinese historical sources will be added to the China Historical GIS at Harvard and annotations from medieval European and Arab sources will be added to our gazetteer at Portsmouth. 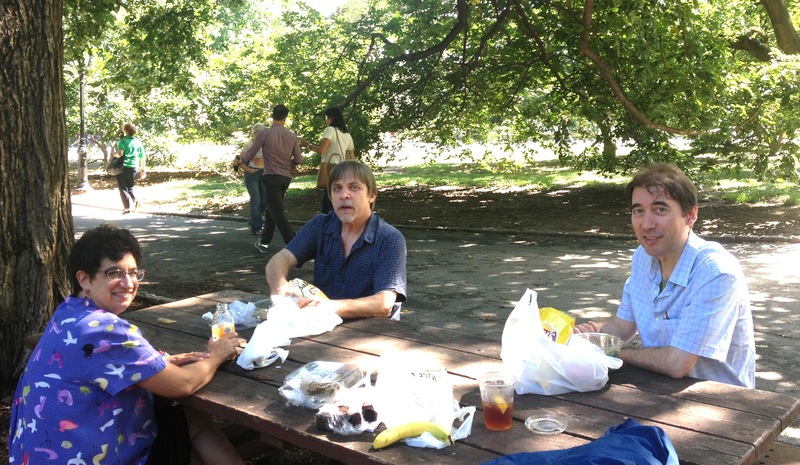 Ruth Mostern (UC Merced), Karl Grossner (Stanford) and Lex Berman (Harvard) having lunch in Central Park during Pelagios 3 kick-off meeting. For now, this is not about the wide range of content accessible through Vision of Britain, like old maps and historical statistics, but simply about the gazetteer of “places”, with variant names, which forms our most accessible layer. We will be very rapidly extending this by importing “places” from Wikidata. Vision of Britain is obviously inappropriate here, so this will be publicised as PastPlace, and use the internet domain pastplace.org. Our own funding from Pelagios is quite limited, and entirely to further develop the Linked Data API we are already running at http://data.pastplace.org/search. We obviously want to also create a web site for people to use, and extend the content to include historical information that is less than 500 years old, but we cannot announce anything immediately. Behind the scenes there will be just one body of information, held in a single database, and in the very long term PastPlace may completely replace Vision of Britain. However, for the forseeable future our British content will be far richer than what we hold for anywhere else, so two “brands” and web sites seems appropriate. This entry was posted in Events, Funding and tagged gazetteers, linked data, New York, PastPlace, Pelagios 3, Pleiades. Bookmark the permalink.